Did you know that Cockroaches are one of the most common insects on the planet? There are about 3,500 species and around 60 species are in the United States. Some are more than likely within several hundred feet of where you are right now. In Ohio, the most common species found are the German, Oriental, and American cockroaches. Scientist have found through fossil evidence that cockroaches have been on earth for about 300 million years. They are considered one of the most adaptable insects in existence today. The American cockroach is the largest of the species and are common to Ohio, Indiana and Kentucky. This species is often found in city dumps and are most common in the basements and steam tunnels of restaurants, bakeries, food-processing facilities, and grocery stores. If you have ever opened your kitchen cabinet at night and seen the little critters run from the light, you’re more than likely seeing the American cockroach. Adults are approximately 1-1/2 inches long and reddish brown, with fully developed wings that cover the entire length of the abdomen. Both male and female are fully winged. The wings of the male extend slightly beyond the tip of the abdomen, while those of the female are about the same length as the abdomen. Nymphs are similar in appearance but are smaller and do not have wings. American cockroaches are capable of flying but rarely do in northern areas of the United States. The American cockroach can be identified by its large size and reddish brown color with faded yellow edges on the thorax. When found indoors, the nymphs and adults are usually found in dark, warm and moist areas of basements, cabinets and crawl spaces, and in and around bathtubs, clothes hampers, floor drains, pipe chases, and sewers. They are also common around the manholes of sewers, and on the undersides of metal covers over large sump pumps. In the Midwest, this cockroach is often associated with steam heat tunnels. Where steam heat tunnels are not found, the American cockroach is restricted primarily to large institutional buildings and homes. It has also been observed migrating from one building to another during warm months in the Midwest. Occasionally, the cockroaches infest sanitary landfills and can survive Ohio winters because of the warmth generated within the piles of trash. American cockroaches feed on a variety of foods, with an apparent preference for decaying organic matter. The adults can survive two or three months without food and will eat almost anything, but can only survive around a month without water. American cockroaches have three developmental stages: egg, nymph, and adult. The eggs are laid in capsules that are dark brown, symmetrically shaped, and about 5/16 inch long. The female drops her egg capsule within a day after it is formed. She often drops it in a suitable location near a food source or in a protected area. Each capsule averages 14 to 16 eggs. Usually one capsule is produced each week and is often glued to a hidden surface with secretions from the female’s mouth. Each female produces from 15 to 90 egg capsules. The length of the egg stage varies from 29 to 58 days. At room temperature, nymphs hatch out in 50 to 55 days. Young nymphs are grayish brown and after the first few molts become reddish brown. The nymphal stage varies in length from 160 to 971 days. The number of offspring per year averages 800. Under ideal conditions an adult female can live up to 15 months, males for a somewhat shorter period. American cockroaches feed upon a great variety of materials such as cheese, beer, leather, bakery products, starch in bookbinding’s, manuscripts, glue, hair, flakes of dried skin, dead animals, plant materials, soiled clothing, and glossy paper with starch sizing. 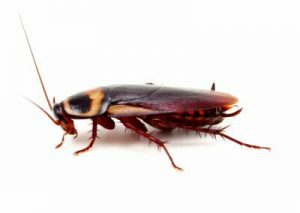 The most important aspect of cockroach damage derives from the insects’ habit of feeding and harboring in damp and unsanitary places such as sewers, garbage disposals, kitchens, bathrooms, and indoor storage indoors. Filth from these sources is spread by cockroaches to food supplies, food preparation surfaces, dishes, utensils, and other surfaces. Cockroaches contaminate far more food than they are able to eat. From various points in their bodies American cockroaches, and cockroaches in general, produce odorous secretions that can affect the flavor of various foods. When populations are high, these secretions may result in a characteristic odor in the general region of the infestation. Disease-producing organisms such as bacteria, protozoa, and viruses have been found in cockroach bodies. Different forms of gastroenteritis (food poisoning, dysentery, diarrhea, etc.) appear to be the principal diseases transmitted by these cockroaches. These disease-causing organisms are carried on the legs and bodies of cockroaches, and are deposited on food and utensils as cockroaches forage. Cockroach excrement and cast skins also contain a number of allergens, to which many people exhibit allergic responses such as skin rashes, watery eyes, congestion of nasal passages, asthma, and sneezing. Survey – To control American cockroaches, it is important to do a thorough inspection. A cockroach survey (trapping) is sometimes necessary to determine the extent of an infestation, as even a thorough inspection does not always reveal all cockroach foraging areas. Cockroach surveys involve placing sticky traps at strategic locations within the building. Whenever possible, place survey traps either against a wall or in a corner of the floor, a shelf, a drawer, or under equipment and counters. Most commercially available traps come complete with bait to encourage cockroaches to enter. One week of trapping with a sufficient number of trapping sites usually provides enough information for effective control. Sanitation, Structural Modifications, and Repairs – Modifying the interior environment—removing food, moisture, and harborages available to cockroaches—is the first step in treatment. Eliminating cockroach harborages involves caulking in closets and cabinets, caulking under the sink, etc., or making similar structural repairs in the kitchen, bathroom, and other areas of the house. Cockroaches typically enter homes via boxes, grocery bags, suitcases, furniture, etc. To prevent the insects from establishing a breeding population, clean up all spilled food materials, including crumbs on the floor. Do not leave dirty dishes overnight. Store items such as cereal, crackers, cookies, flour, sugar, and bread in airtight containers. Chemical Control – Dusts such as boric acid, silica aerogel, and diatomaceous earth can be applied to voids and other harborages such as cracks and crevices. Do not apply dusts to wet or damp areas. Dusts should be applied lightly because heavy deposits may repel cockroaches. Do not place dusts where children or pets could come into contact with them. Take care to keep children away from areas treated with boric acid. Take precautions to assure that the dusts do not contaminate food. If you try to make this a DIY project, please understand that pesticides are poisonous. Read and follow directions and safety precautions on labels. Handle carefully and store in original labeled containers out of the reach of children, pets, and livestock. Dispose of empty containers right away, in a safe manner and place. Do not contaminate forage, streams, or ponds.